Running late again, but it seems to be that time of year. Ever since my Joe Donahue post just before Thanksgiving I've been hunkered down working on the sales end of this business, but I find myself with just enough free hours this morning to put our Turner Classic Movies December preview together. December should be a festive month on TCM. 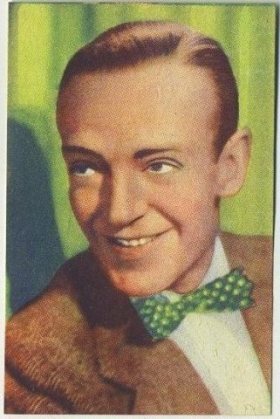 Our Star of the Month is Fred Astaire, which mostly means Fred & Ginger to me. That works out well since Fred & Ginger is the theme for two of TCM's four Astaire nights. They are showing a total of 25 Fred Astaire movies over the following four Wednesday nights--10 of those featuring Astaire with Ginger Rogers. The "Holiday Classics" theme runs throughout the month with a total of 31 familiar favorites including a whole lot of Ebeneezer Scrooge. The Friday Night Spotlight is on "The Hollywood Costume" and that feature includes a few titles that will be highlighted below in the main preview. Prime Time December 30 is a thoughtful response to our wondering where the Deanna Durbin and Annette Funicello movies were following their deaths earlier this year--a few other names are highlighted in this evening of tributes as well. And we bid farewell to The Story of Film with the final entries airing tonight and next Monday surrounded by several films from the last twenty years that will have me looking for alternative entertainment. These picks are based upon Turner Classic Movies' US schedule (most also air in Canada). Any times mentioned are all EST because that's what TCM uses inside my Now Playing Guide and that's what I use when I set the clocks here on Long Island. The days are TCM's own slightly screwy time periods, typically beginning at 6 am and working through to the following morning at the same time. When I recommend something at 12:00 am Saturday it is technically airing just as your calendar flips to Sunday. Monday, December 2, 7:15 am - Woman Wanted (1935) is part of TCM's daytime "Crime Comedies" theme. Besides the comedy it includes some good action and moves pretty fast overall. Starring Maureen O'Sullivan and Joel McCrea. A few hours later, at 10 am, Glenda Farrell stars in Torchy Runs for Mayor (1939), one of her seven outings as steak-loving reporter Torchy Blane. 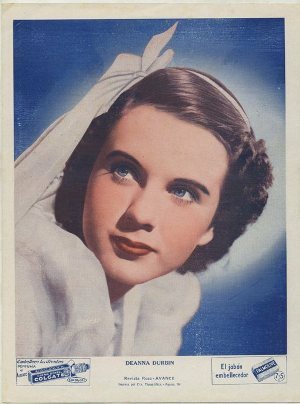 I wrote a biography of Farrell this past Summer soon after she was featured during TCM's annual Summer Under the Stars programming. If you'd like to revisit some old ads I also did a Glenda Farrell Picto-Sked to celebrate that day. Tuesday, December 3 - Somehow I've yet to cover any of the five classic titles playing on Tuesday night beginning at 8 pm: White Heat (1949), followed by The Roaring Twenties (1939) at 10 pm, The Big Heat (1953) at 12 am, Key Largo (1948) at 2 am and The Petrified Forest (1936) at 4 am, but "Mob City" is a favorite theme of the site and I have covered several other gangster titles found here. ** The schedule in my Now Playing guide for daytime December 3 differs from what is posted on TCM's website. In the guide they have a "Technicolor Celebration" listed; online it's classic gangster movies that lead into that evening's schedule of more classic crime. You can check out TCM.com's December 3 schedule here (and hope!). 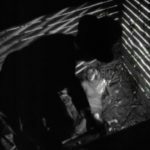 If they go with the online schedule then you can revisit my post about The Doorway to Hell (1930) HERE. Wednesday, December 4 - Fred and Ginger Part 1 kicks off Astaire month at 8 pm. A popular post on the site is my look at early Ginger Rogers, pre-Hollywood, from a couple of Summers ago. Friday, December 6 - 1934's Cleopatra plays at 10 pm EST during TCM's first Friday Night Focus on "The Hollywood Costume." I gave Cleo double-treatment and you can read all about it both HERE on Immortal Ephemera and also take a look at it from Caesar's point of view at my Warren William site (Warren played Caesar). Cleopatra follows a rare showing of Marlene Dietrich in Josef von Sternberg's Blonde Venus (1932) at 8 pm, which I've yet to cover but wanted to make sure you didn't miss. The Hollywood Costume feature plays throughout the night and into the following morning, December 7, when Anna Karenina (1935) airs at 7 am. 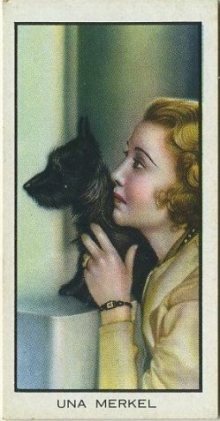 You'll find background on Garbo's little Sergei, Freddie Bartholomew, HERE, in the most popular article on the site. Monday, December 9, TCM celebrates Margaret Hamilton's (1902-1985) birthday with a nine-movie marathon between 6 am and 8 pm. No, they don't play The Wizard of Oz (1939). 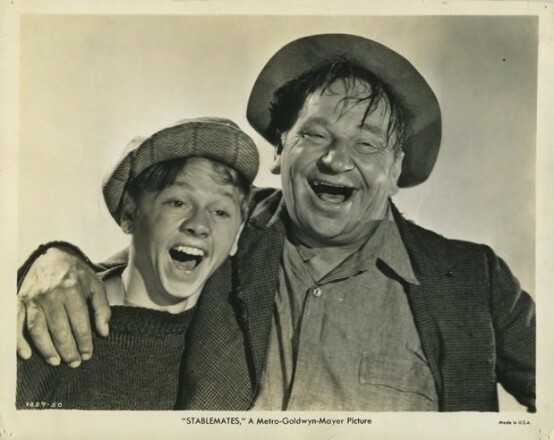 Stablemates (1938), in which she harangues Wallace Beery, is the only one of these titles that I've written about in detail, but I've covered several of the stars that dot this Hamilton-themed schedule. 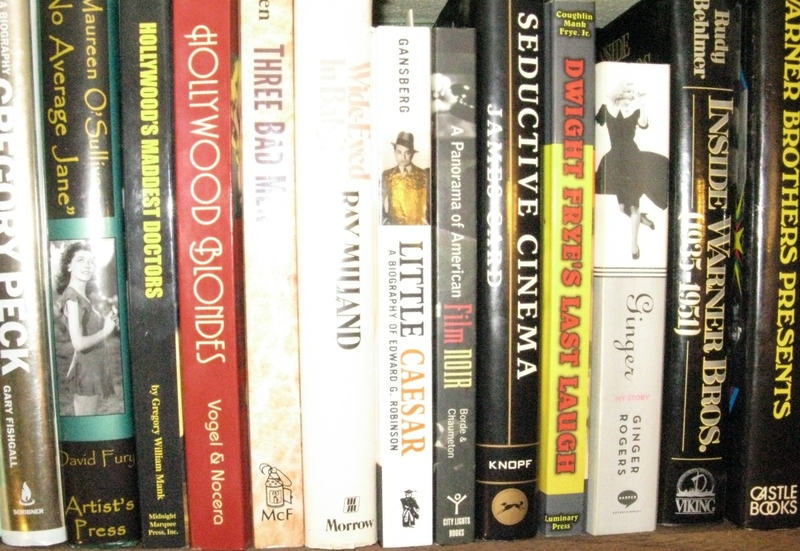 Most notably you'll find biographies of Marian Marsh, Edward Ellis and Helen Hayes on the site. Phillips Holmes is another favorite, and while I haven't put together a full fledged biography as of yet, there is much mixed into these few posts about some of Holmes' better movies. 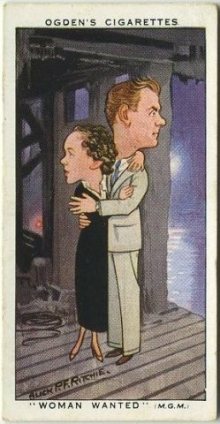 Tuesday, December 10 - "Dynamic Duos" day opens with Manhattan Melodrama (1934) at 6 am, leaving me to wonder which duo they're referring to. 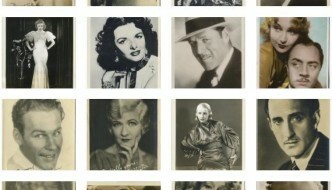 Most likely Powell and Loy, but you've also got Loy and Gable and even Gable and Powell. Plenty of equal pairings out of that trio! 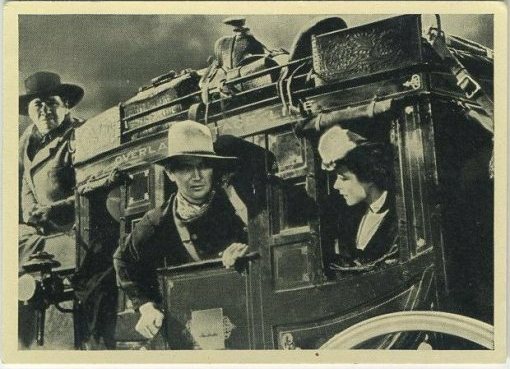 Before that becomes too puzzling I'll point you back to my post about Myrna Loy's early days in Montana. Wednesday, December 11 - "Gridiron Greats" is the daytime theme. Well, TCM overlooked Warren William's December 2nd birthday and they don't do much for me on mine either. I haven't been an NFL fan since I was a kid, but these (mostly) 1930s football movies can still be fun. If you catch Huddle (1932) at 6:45 then you might want to revisit my Una Merkel biography, it's a favorite post. And William Wellman's College Coach (1933) following at 8:30 includes Ann Dvorak amongst the cast -- Here's my recent interview with Dvorak's biographer, Christina Rice. Or you can just pick up Christina's book HERE if you prefer. Later that afternoon TCM plays classic Knute Rockne, All American (1940) starring Pat O'Brien with a nose that distracts me a lot more now than it used to! 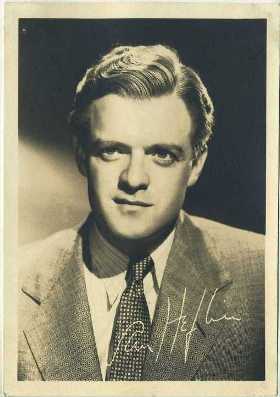 Friday, December 13 - An eight-movie Van Heflin birthday (1910-1971) fills out the daytime programming. I've touched upon one title, Tennessee Johnson (1942), in this round-up and also wrote a bit about Van Heflin himself HERE. Among the Heflin co-stars appearing on Friday the 13th I'll point a second time to my Marian Marsh biography, as she co-stars in Saturday's Heroes (1937) at 7:45 am (more '30s football! ), and I have all of the details about Grand Central Murder (1942) co-star Cecilia Parker HERE. Parker is best known as Mickey Rooney's big sister, Marian, in the Hardy Family movies. Saturday, December 14 - A trio of Claudette Colbert favorites in Prime Time: The Palm Beach Story (1942) at 8 pm, Tomorrow Is Forever (1946) at 9:45 pm and Midnight (1939) at 11:45 pm. Nothing against Tomorrow is Forever, but not sure why they'd want to put such a big buzz kill in between that pair of screwball classics. More on Miss Colbert's early career HERE. Monday, December 16 - Nothing to link up on this title--yet--but Attorney for the Defense (1932) plays at 6 pm and I didn't want you to miss it. Tuesday, December 17 - Updated: Eleanor Parker tribute. Details and schedule here. Shakespeare movies all day and a pair of holiday favorites later that night: Barbara Stanwyck and Fred MacMurray in Remember the Night (1940) at 9:45 pm and Ginger Rogers and David Niven in Bachelor Mother (1939) at 1:45 am. Bachelor Mother co-star Charles Coburn is covered HERE. 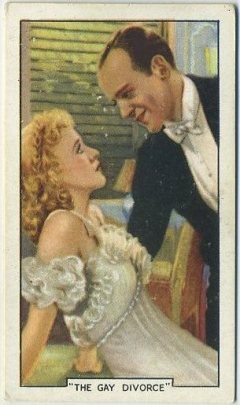 Victor Jory and Anita Louise at the center of this 1940 A & M Wix Max Cinema Cavalcade Tobacco Card depicting a scene from A Midsummer Night's Dream (1935), which plays on TCM December 17 at 6:30 am EST. Thursday, December 19 - An evening featuring five different movie versions of Charles Dickens' A Christmas Carol continues the Dickens' theme late into the night with David Copperfield (1935) at 3:45 am. Friday, December 20 - TCM's nine-movie Irene Dunne (1898-1990) birthday marathon will be a December highlight for many. 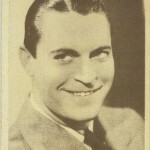 A great mix of titles includes Dunne melodramas such as Ann Vickers (1933) and The Age of Innocence (1934), musicals like Sweet Adeline (1935) and classic Show Boat (1936), and screwball comedies such as Dunne's pair with Cary Grant, The Awful Truth (1937) and My Favorite Wife (1940). 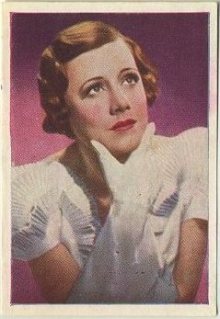 More on Irene Dunne HERE plus a brief look at No Other Woman (1933), which opens the day at 6 am, on THIS page. Several days of holiday classics of all types follow leading up to TCM's routine schedule of "Religious Favorites" on Christmas Day. Barring Miracle on 34th Street (1947) and It's a Wonderful Life (1946), if you have a favorite, it's probably playing between December 22-24. Later, Christmas night, comes Fred Astaire's final night as Star of the Month -- Part 2 of his pairings with Ginger Rogers. Thursday, December 26 - "Academy Award Winning Classics" is the daytime theme and those titles include The Narrow Margin (1952) at 6 am and Mr. Smith Goes to Washington (1939) at 9:30 am. More Irene Dunne for you that afternoon in Life With Father (1949) starring William Powell at 6 pm. Friday, December 27 - The day opens with four from John Ford: Gary Cooper in The Adventures of Marco Polo (1938) at 6 am; Stagecoach (1939) at 8 am; The Grapes of Wrath (1940) at 9:45 am, and a personal favorite, How Green Was My Valley (1941), at 12 noon. A nice mix of classic Ford titles to start your day. That evening, the final night of focus on "The Hollywood Costume" begins with Joseph Cotten, Dolores Costello and Tim Holt in Orson Welles' The Magnificent Ambersons (1942) at 8 pm. Simply one of the best movies of all-time. For more about The Magnificent Ambersons, I recommend Jim Lane's magnificent series posted at his Cinedrome in 2012 and beginning here. Saturday, December 28 - Nothing to link to, but a dark night of "Spellbinders" on TCM deserving mention: Gaslight (1944) at 8 pm, Suspicion (1941) at 10 and Leave Her to Heaven (1945) at midnight. Updated: Sunday, December 29 - Tributes to Joan Fontaine and Peter O'Toole. Details and schedule at bottom of this post. Monday, December 30 - Between 8 pm and 9:30 Tuesday morning TCM plays seven titles in tribute to movie stars who passed away during 2013. Deanna Durbin (1921-2013) is featured in It Started With Eve (1941) at 8 pm; Annette Funicello (1942-2013) in Bikini Beach (1964) at 9:45 pm; Eileen Brennan (1932-2013) in The Cheap Detective (1978) at 11:30 pm; Jonathan Winters (1925-2013) in The Loved One (1965) at 1:15 am; Karen Black (1939-2013) in Five Easy Pieces (1970) at 3:30 am; Julie Harris (1925-2013) in East of Eden (1955) at 5:15 am; John Kerr (1931-2013) in Tea and Sympathy (1956) at 7:15 am. Each will certainly be included in TCM's annually acclaimed "In Memoriam" video that will be airing on the channel throughout the month. Tuesday, December 31 - "New Year's Eve Dance Party." A painful ending to the year that will certainly find me tuning in to a Twilight Zone marathon on another channel. 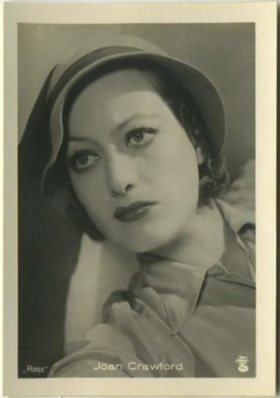 TCM's Star of the Month for January will be Joan Crawford. For more TCM in December recommendations be sure to check out Kristina's December Classic Viewing Guide at the Speakeasy (It's already posted this month). I'll be back next with a new gallery, which reminds me to point you over to the Immortal Ephemera Store once more. 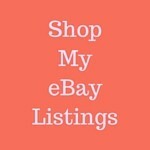 The shop is packed with nearly 7,000 vintage movie collectibles: cards, postcards, photos and other paper that will fit any budget. In fact, you'd be hard pressed to spend five or ten bucks on a more interesting stocking stuffer than I can ship you. Once the gallery post comes out I think I'm going to concentrate on talking about some of the movies of 1931. With good reason. There's just been a brand new blogathon announced and it's a whopper! The Classic Movie History Project Blogathon, being hosted by Movies Silently, Silver Screenings and Once Upon a Screen, is going to cover each year of screen history between 1915 and 1950. While I just missed my first choice (1932) by a few moments, it's in good hands and I was able to grab my back-up choice: 1931. The Classic Movie History Project posts will be going up around the web between January 12-14, 2014, so I figured, why not make a month of it? 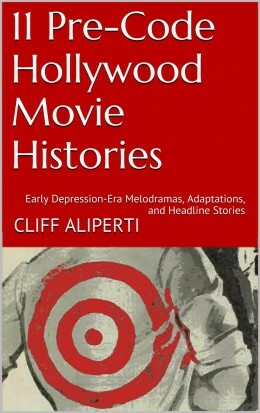 Here are some of my past articles about movies from 1931 and I'll aim to grow that by at least three or four by the time of my January entry about the year in film as a whole. Thanks, I’m looking forward to this. Going to make a bit of an event out of it here and try to cover a few more movies from 1931 leading up to the Blogathon. I seem to find myself doing that often enough anyway! 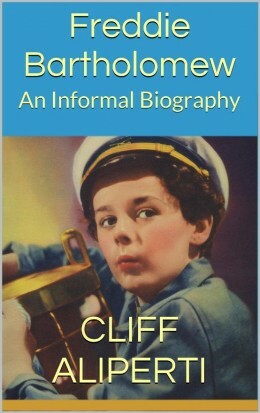 Hello Cliff. I was recently introduced to you through Will. Just met him also! Blogs certainly are a wonderful thing! 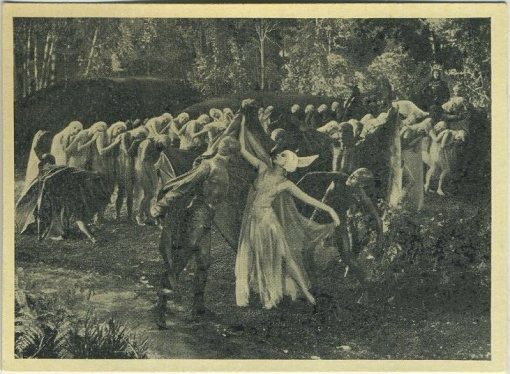 Can you help regarding an old film? Will gave me the name of this movie I had forgotten. Carol Reed’s …… The Fallen Idol …. 1948. When will it be shown (again) on TCM? A must to mark the date on my calendar! If this movie is available it would be great to own. I had no idea you are the coordinator for all TCM filming. Wow. What a neat job! Just to be clear–I am in no way affiliated with TCM. I’m just a fan like you are. This post contains my recommendations for what they have scheduled this month–I post a similar article each month pointing to movies I like or want to catch myself. Having a look at the TCM website, it does not appear that The Fallen Idol will be playing on the channel anytime soon. Assuming you’re in the US, I see that the 2006 Criterion DVD release has gone out of print–copies are available from third party sellers at slightly inflated/collectible prices (Here). A more affordable option is to stream it, watching it either on your computer or on your TV through a device like the Roku. Here’s Amazon’s page for that. Once again, pleased to meet you and good luck with that movie. I do hope you subscribe to the site so you’ll receive my future mailings.